Sturbridge; The town has recently awarded a $ 51,795.00 contract to CME Engineering of East Hartford CT to provide engineering design and permitting for the ¾ mile portion of the Titanic Rail Trail, Grand Trunk Trail section from the Ed Calcutt Bridge to River Road. Of the $51,795 contract $41,440 is being paid from a part of the larger Transportation Enhancements Act (TEA) grant awarded by Mass Department of Transportation (Mass DOT) to the town, and the remaining $10,355 is appropriation from the Betterment Fund. CME’s contract calls for a 100% design and permitted plan to be acceptable by Mass DOT to allow Mass DOT to bid construction for this section of trail. It is estimated that the design and permitting phase will take about 1 year as several public hearings on the plan as well as environmental review and hearings conducted by the Conservation Commission will be required. Work will commence this winter with flagging and topographic surveying of the trail route, confirming wetland boundaries, along with measuring and listing all trees that may need to be removed to accommodate the trail. The proposed design is for a 10’ wide hard packed fine gravel trail with 2’ wide shoulders and a 5’ wide sidewalk along Farquhar Rd to the River Rd intersection including a redesign of the River Road/Farquhar Rd intersection to improve safety. Mass DOT will fully fund 100% of the construction costs from the TEA grant authorization and will administer the construction of the trail. Approximately ½ mile of this ¾ mile trail section is on lands of the U.S. Army Corps of Engineers, Westville Lake Flood Damage Reduction project. The remaining lands are owned by the Town of Sturbridge and the Morse Family. A trail easement is being granted by the Morse Family. Under a cooperative trail agreement, Park Ranger Tom Chamberland of the U.S. Army Corps of Engineers will be overseeing this project for both the Corps and the Town of Sturbridge. With the completion of this section of the Titanic Rail Trail, ½ of the approximately 6 mile route will be completed thru the town. The Sturbridge Trail committee is actively working on several other sections including engineering and design of the 1.2 mile River Lands portion, a grant from The Last Green Valley to complete a ¼ mile section of the Fiskdale portion, known as the Trolley trail, and has applied for grants to complete the remaining ¼ mile section out to the East Brimfield Lake Dam. Anyone with questions regarding this project or any Grand Trunk Trail section of the Titanic Rail Trail thru Sturbridge can contact park Ranger Tom Chamberland at Thomas.a.chamberland@usace.army.mil or call 508-347-3705. For more information on the Sturbridge Trail Committee, contact its chair, Randy Redetzke at rredet@charter.net The Sturbridge Trail Committee meets on the 2nd Thursday of the month 6 PM, Center Office Building. 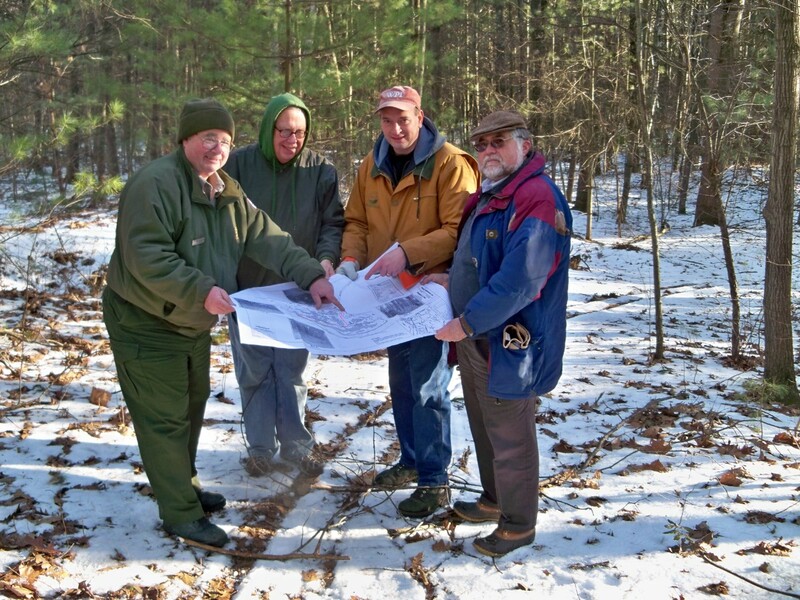 From left to right: Park Ranger Tom Chamberland, Trails Committee volunteer Charles Blanchard, CME’s representatives, Engineer and Project Manager Scott Young and Director of Commercial Development Richard Strouse orient themselves with the wetlands delineation plan for the proposed trail route as they prepare to walk the trail route.